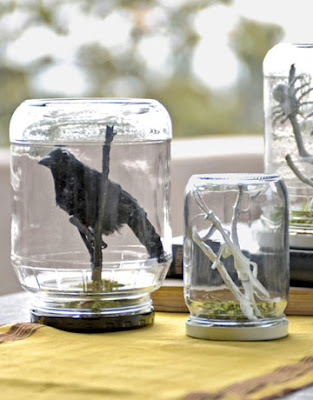 Here's another round of creep-tacular faux terrariums for Halloween decorating at countryliving.com. I like the bugs inside and the crow one is downright frightening. Most years I love decorating for Halloween but this year- the inspiration has not hit. Maybe I haven't seen the right fake creature to make a frightful terrarium. Happy to find your blog and I love the upside down terrarium idea. I don't think I would like that Crow one staring at me.